There's a reassuring constancy about the New York City skyline, one that's seared into our collective subconscious from countless films and TV shows. When we visit New York and spy those nests of skyscrapers, it’s like seeing an old friend, whether we’re taking a cab over the Brooklyn Bridge or looking back from the Staten Island Ferry. New perspectives don’t come along with too much frequency, but a dramatic view of Manhattan’s east side, combined with an intriguing and impressive new park, has opened. 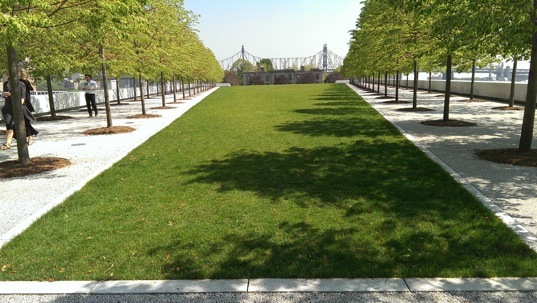 The Franklin D. Roosevelt Four Freedoms Park is a new, masterfully-designed green space on Roosevelt Island, plum in the middle of the East River. This memorial looks out to the east over Brooklyn and to the west over east Mid City and in particular, the United Nations building. FDR inspired the creation of the United Nations, and the idea of a memorial park was first floated in 1973, the city enlisting genius architect and designer Louis Kahn as visionary and creator. With the plans completed, the city promptly went bankrupt and everything was shelved until March 2010, when the go-ahead for construction was finally granted. The park gets its name from a one of FDR's most famous wartime speeches, calling for the world to safeguard the freedoms of speech and worship and the freedoms from want and fear. This former landfill, for 40 years not much more than a forgotten heap of rubble, is reborn. The park itself is a visual delight. Kahn conceived a memorial filled with architectural metaphor and a bag of visual tricks. 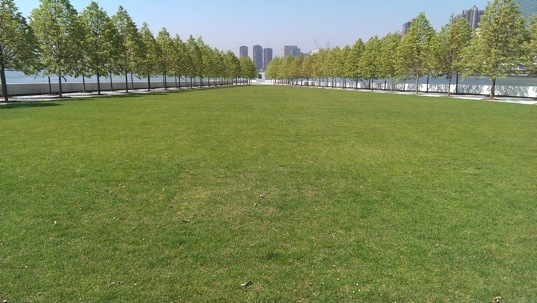 You approach the memorial via a solemn, 100-ft wide flight of steps, but are immediately rewarded with a view of the lawn, flanked by two rows of linden trees that force the perspective to taper off into the seemingly infinite distance. There’s also the shell of a long-abandoned, 19th century smallpox hospital. This, it is hoped, will eventually be refurbished and become the park’s entrance pavilion and visitor centre. The lawn is actually a triangle. But when you reach the far end and look back, the effect of the trees is reversed, and it appears rectangular. Kahn's tricks have been faithfully rendered. At the far end, where the back of the UN building comes into view, is ‘the room’. This is almost a modern art installation, with polished granite blocks creating monolithic walls. Small gaps between them let changing light patterns through as the sun passes. There's a huge bust of FDR that dominates the room, which has a serene, respect-laden feel to it, despite all the playful touches. Around the sides of the lawn, more pathways slope down and follow the water’s edge. These too are designed with perspectives that create optical illusions. Stop and watch someone walk down the path and they seem to shrink before your eyes and look like they’re walking along a pathway that will never end. The park's relative isolation gives it a sense of tranquility, and you can spend hours taking in the escape that even Central Park can’t really offer, and that the High Line definitely doesn’t. In the end, the curiosity of Kahn's illusions are just part of the overall sense of monumentality and scale. Kahn was aiming for something uplifting and extraordinary. In some ways it's a physical representation of FDR's positivity and hope for humanity. The Franklin D Roosevelt Four Freedoms Park (www.fdrfourfreedomspark.org) is on Roosevelt Island, NY. It is open six days a week, from 9am-7pm. Closed Tuesdays. The park is accessible via the F Train and the Roosevelt Island Tram. You can also reach the park via car and bike - see the website for full accessibility details. Kahn is regarded as one of America's greatest architects. 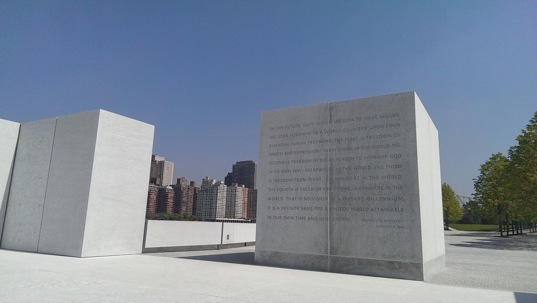 Many of his works call to mind ancient structures - see the monoliths used to create 'the room' in Four Freedoms Park. His most famous works include the Yale University Art Gallery, the First Unitarian Church in Rochester, New York and the Kimbell Art Museum in Fort Worth, Texas. 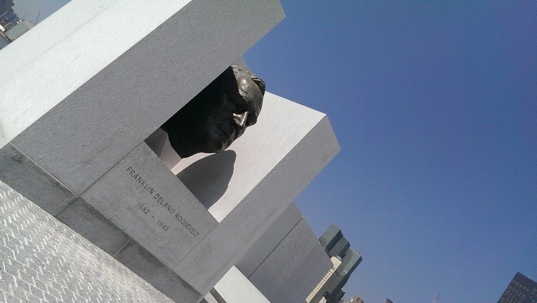 The FDR Four Freedoms Park is the only one of his designs to be constructed posthumously. He is the subject of the 2003 documentary film My Architect, directed by his son, Nathaniel Kahn.